Baudrillard’s criticism of modern art and the role of simulacrum within other mass media has turned my attention to my personal artworks and their identity in our “dream world”. Both Baudrillard and Benjamin work on the same idea that we are living in a dream world. However, where Benjamin pushes us to wake up, Baudrillard is just nostalgic about the past, knowing that we live in the midst of a dead reality. Furthermore, Baudrillard meditates on the role of modern art: 1) it is a simulacrum of itself, 2) it presents no discourse to the viewer, it doesn’t look at you and so you are not invited to look at it either, 3) it is completely indifferent; 4) it is the metalanguage of banality. In reality modern art is a direct response to the banality of our daily lives. Does this banality mean that the real art is dead? I believe that it is not just the death of art and its social value, but it is the death of real life itself, which is the base of the death of the social production of art. Furthermore, we believe in the ideology of art and not in itself. In this sense, the artworks that we see in museums do not work on ideas because they are themselves ideas. It is the negation of an idea within the idea itself, as Baudrillard emphasizes is the modern ideology of art. 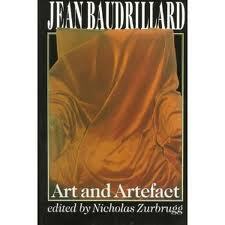 Baudrillard further states that if the activity of art has no existence of its own, then it must be disappearing. It is disappearing because it has not space for illusion. With the infiltration of the camera, computers and technology in general, the arts have been aiming at achieving greater pixilation, more realistic representation of the world. The gap between the ‘real’ and the 2D representation of images is the space for illusion and imagination. With the aim of technology to perfect the image on computers, and to relay the sense of 3D and even 4D world in the auditoriums of the movie theatres, art has left no gap for the illusionary. Thus, the practice of art has no existence of its own and is dying out. However, what is the role and function of sculpture in the modern world? In its 3D form, sculpture is a medium, which works closer with ‘reality’. Furthermore, the illusory has no history while the aesthetics have history and therefore an end. The purpose of art is to capture the real, not to liberate it. In this sense, what modern sculpture tries to achieve is to go beyond the representation. It is this struggle to achieve an intellectual position of illusion by passing from one form to another, instead to negate the idea by going beyond the idea itself. Furthermore, modern art is rather one of aesthetical property, thus it has an end. I also wanted to concentrate on the idea that sparked in my brain while I was battling with the Baudrillard text and thinking of the identity of modern art. One can often hear statements regarding contemporary art as being, “I can paint this” or “So, after I spill a bunch of paint on canvas I will write something very deep in order to confuse the public” and etc. In this sense, I have wondered whether modern paintings should first start with a certain philosophical intentions, or whether the intention and explanation should be composed after the creation of the piece? In modern art, it seems that one cannot differentiate if the idea or the artwork came first since a lot of them seem accidental to the general public. In this manner, the modern pieces create no discourse with the public, and the public looks at them as a blank spot on the wall. One cannot tell the difference between an accidental artwork and one with pre-meditated intentions. Furthermore, if an artwork is created without an intention, does it mean that it relates closer with taking away from the ‘real’?. In a sense, if one pre-meditates on a painting, one is working on an idea, which later negates itself to itself. In this case, the painting is a simulacrum of itself and it is a mere representation of an aesthetical idea. However, if one is to meditate on the already finished artwork, it shows that one didn’t try to represent an idea previously thought out. This is all absurd! How can one then go beyond the form not the idea? For example, we can look at Pollock’s paintings, which focus on the act of painting, not on the representation of an idea. However, one might argue that the act of the creation IS the idea itself. Maybe the intentions behind the artwork is what makes it a modern piece, because it no longer looks to the ‘real’ to take away from, but meditates on a personal ideology, which IS a simulacrum of itself. Thus, we cannot escape from the ideology, and ideology cannot escape from us, because everything is based on ideology, which in itself is a simulacrum. So, in the end one might ask, when and where was the Real world for Baudrillard? Can it be within the cave paintings of Lascaux, where the images of bulls and cows didn’t serve an aesthetical purpose, but conveyed the illusionary discourse between the flat walls of the caves and the Real fields where bulls ran through the real atmospheric time and space?